There are many working formulas for a date night. Going out for dinner, a walk in the park, a movie night in, you name it. That said, there are rewards to taking an adventurous date. If you’re in the market for something fresh, you could be in luck! 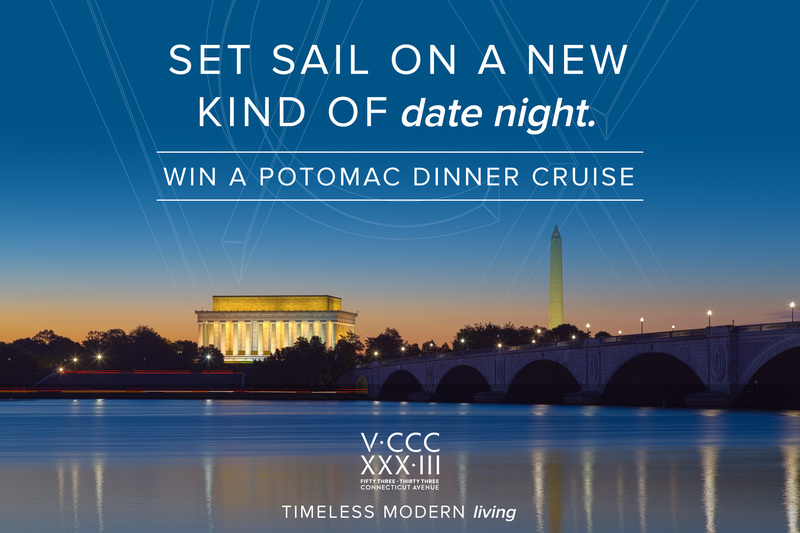 5333 Connecticut Avenue Apartments is giving one lucky winner 2 tickets for a dinner cruise on the Potomac River. Impress your date with fabulous cuisine and a scenic sailing session on one Friday evening this summer. All you have to do is enter your name and email below—once you’ve done that, you’ll be automatically entered to win this recipe for an amazing date night! This information will only be used to select and notify the winner of the giveaway. If you’d like more information about this giveaway, you’ll find it below the entry form. The prize includes two (2) tickets for a dinner cruise with Odyssey Cruises. Contest will run from 12:00 PM EDT on 7/6/2016 through 12:00 AM EDT on 7/20/2016. Winner to be notified by email by July 22th. Winning entrant must respond to this email within 3 days—otherwise, a new winner may be selected from the remaining entries. Winner is to communicate with 5333 Connecticut to select one Friday between 7/29/2016 and 9/2/2016. The winner will then receive two (2) tickets for a Potomac Dinner on the selected Friday. Only the first entry per person will be considered valid. 5333 Connecticut Avenue and this giveaway are in no way sponsored by, affiliated with or endorsed by Odyssey Cruises.